70411: Treasure Island is one of the mid range sets from the 2015 Pirates range, and while there’s not much to it, it does add to the mix a very iconic Pirate setting – Skull Rock. LEGO has attempted Skull Rock a couple of times before, with 6248: Volcano Island, and 6279: Skull Island in the mid 90s, and this isn’t too far removed from that. 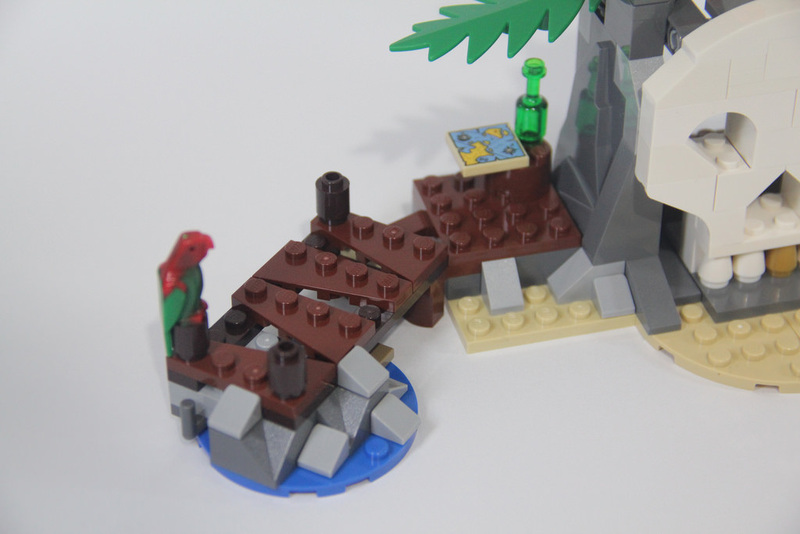 Granted, it’s a bit smaller, but this set is encouraged to join with 70409: Shipwreck Defence, which can make the footprint slightly larger, but not all that much! 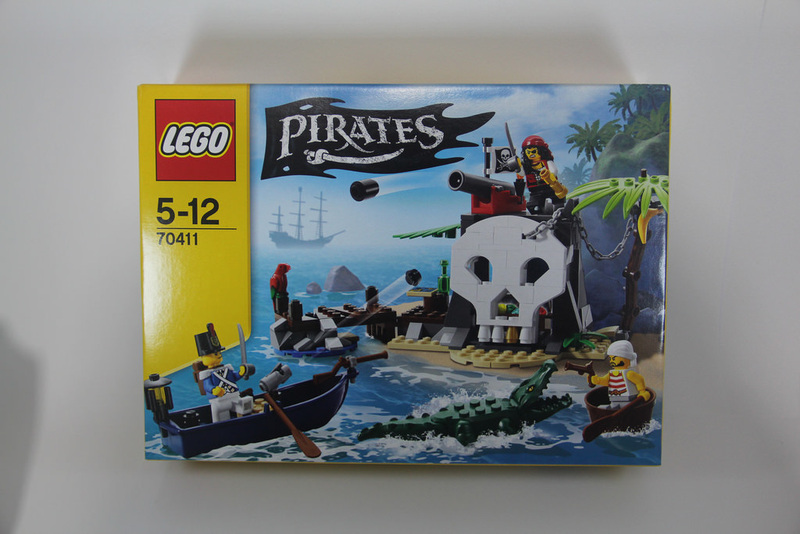 Another Pirates set with even more similarity was 6241: Loot Island from the 2009 release. A little different, but with a lot of similarities! 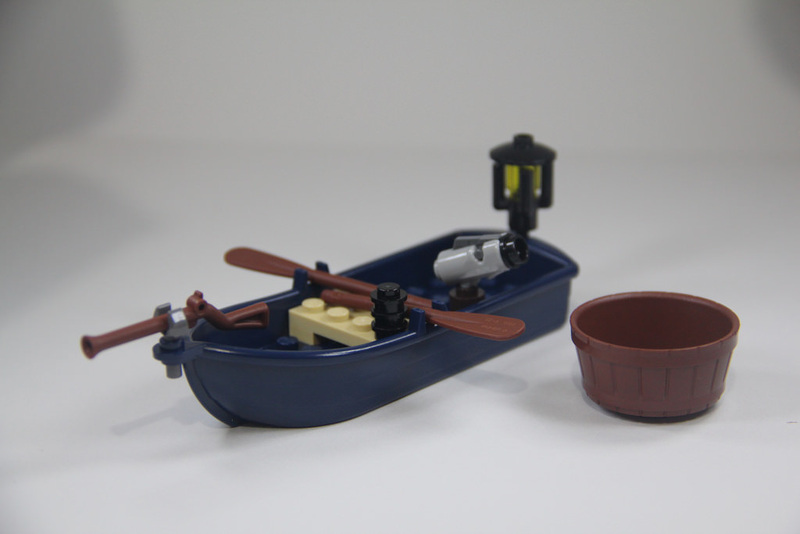 Included in the set, apart from the island itself is a crocodile (the new 2015 mould), and a couple of boats – a Bluecoat rowboat, and a pirate’s floating crowsnest. Firstly, lets take a look at the minifigures. 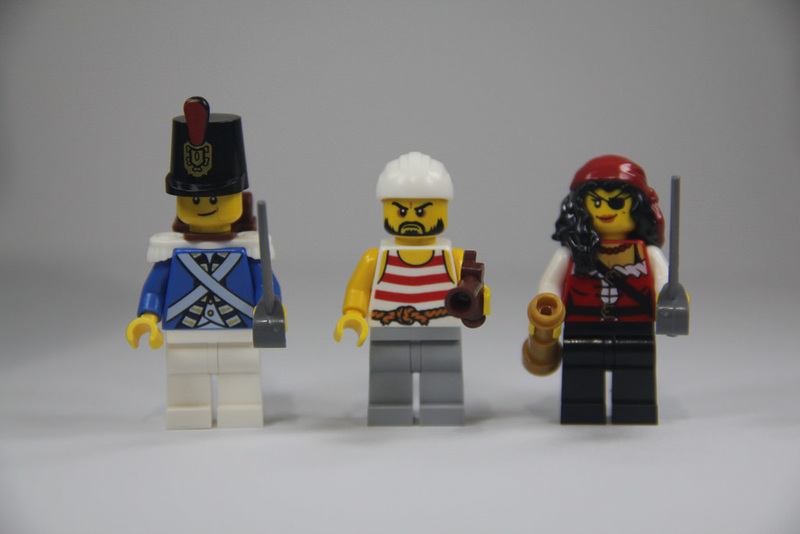 Two of the minifigures – the Bluecoat soldier and the pirate are pretty standard. The best one is by far the Pirate Queen. She’s unique to this set with this torso design, and her face has two expressions – smiling, and angry. Her hair piece was introduced in the Series 9 collectible minifigures, but with a different colour bandana for the Fortune Teller, but it’s red with this theme, and is also seen in 40158: Pirates Chess Set, but paired with a different torso. I really like this minifigure – it’s great to see some females on each side this time! Now the Pirate Queen and the Governors Daughter from last week can battle it out! I was quite happy with the element inclusions in this set. A sand 6×16 plate that’s unique to the set, a blue rowboat, also seen in the Brick Bounty, a 2×2 map tile, a round 6×6 plate in blue, a door (for some secret treasure! ), cannon, arches, parrot, chain, plant life, and the white elements that make up the skull. There’s also some small rock faces, a banana and a chest of loot. It’s pretty good for a small set. 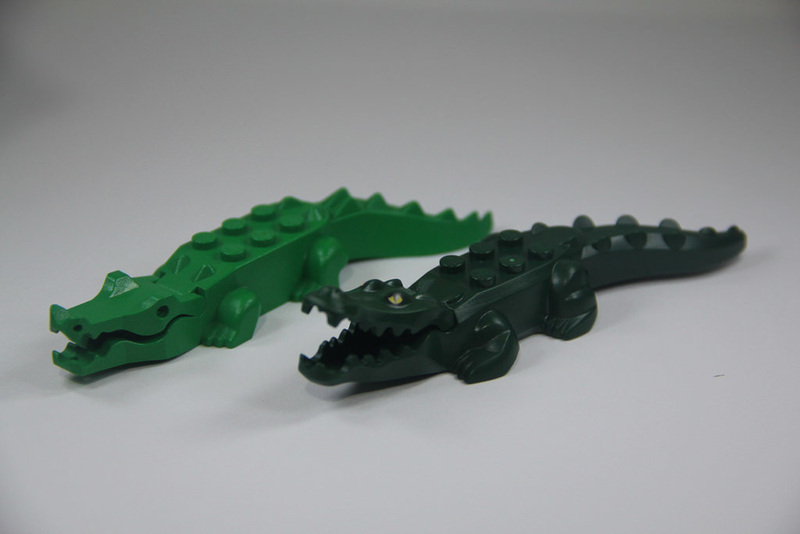 The best thing in my opinion though, is the new crocodile mould. It’s beautiful! Much more detail, a mouth that things can go in, and much scarier, this is a huge improvement over the older mould from the late 80s. I can’t wait to get a few more. The play elements in this set are quite enjoyable. Obviously, there’s the skull rock face that opens up when the tree is pulled down. I thought this was a great way to do it, and adds a unique play element to the set. Once open, the treasure can be seen and looted by the pirates. There’s also the boats, that means a little battle out on the water, and the cannon on the top of the island to back up the pirates. It’s great fun, and adds a lot of fun to a relatively small set. 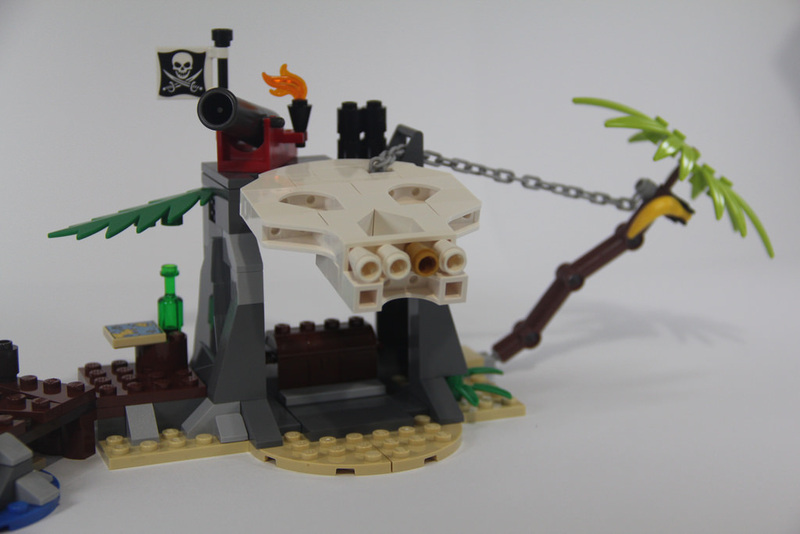 The set comes together quickly, with the jetty being built first, followed by the walls of the cave, and finished off with the tree and skull face. It’s extremely simple, with no deviations from the standard technique of bricks on bricks. The chain adds a nice experience, but that’s it. It’s quick, and would be great for kids. It’s strong, so can take a bit of wrestling around as well. The set is quite small, but there are certain aspects of it that are really stunning, such as the tree, complete with banana, the jetty, and the rocks at the base of it. The skull is also nicely shaped, although the cave is quite small. The gold tooth is brilliant. The jetty is the standout for me though. It looks nicely aged, and the rocks at the end are excellent. It’s a favourite design element for me. For the $28 it cost me, this set was brilliant in this category, but nowadays, if you want one for yourself, you’ll need to fork out a little more, with closer to $50 in some markets. It’s a little much, so if you can get it closer to the $35 mark, or even lower, you’ve got a winner. As I mentioned in the earlier reviews from this theme, this set is collectible if you’re grabbing the whole range, but in an of itself, it’s just another to add to the collection. The positives score-wise are definitely the crocodile and Pirate Queen, and the blue boat. If you’re a fan of the Pirates theme, and especially the reboot, you’ll want to get this one. 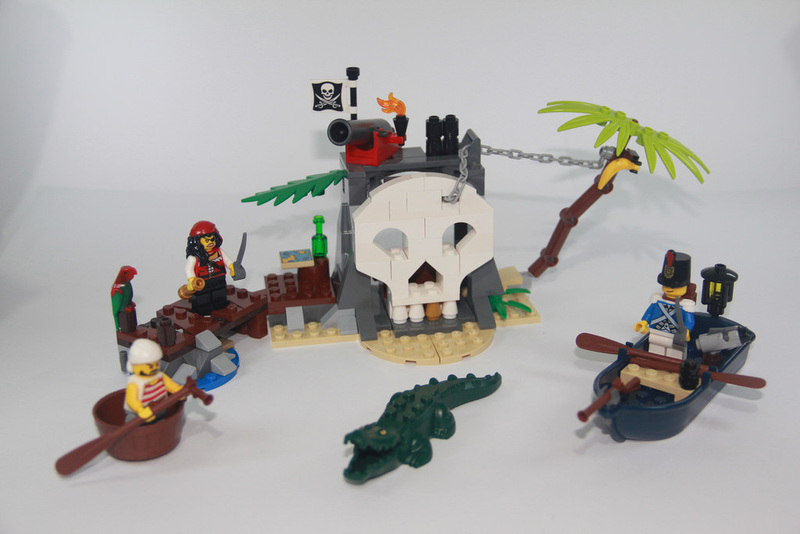 Next week I’ll be looking at the flagship (literally) of the 2015 Pirates theme, with 70413: The Brick Bounty. It should be exciting!